This 153-foot American Tower monopole in Mexico Beach survived Hurricane Michael’s 155 mph assault, but a city water tower adjacent to it appears to have collapsed. Panama City Beach saw some catastrophic damage, and localized flooding and power outages, but faired considerably better than its sister community 15 miles east, Panama City, which also took a severe hit, and many locations look like a wasteland after Hurricane Michael, the third-most powerful storm on record to hit the U.S., and the worst in 50 years, devastated Florida Panhandle communities yesterday. Although Panama City Beach Mayor Mike Thomas was enthusiastic this morning during an interview with CNN anchor John Berman that his city will be able to be put back together “right quickly,” he was concerned about the poor wireless service first responders were dealing with. “We’re going to be fine, but infrastructure-wise, the phone system was the one thing that I saw that failed,” Thomas said. Hurricane Michael made landfall in the early afternoon yesterday near Mexico Beach, and shortly thereafter, although power went out in many areas, so did cell phone service, even though battery backups should have allowed for longer service. 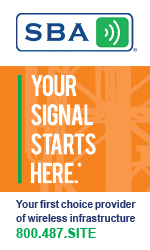 Industry observers believe that many antennas were immediately thrown out of alignment due to the sustained winds of 155 mph as the hurricane came on shore. Mexico Beach in Bay County was decimated the hardest with homes being washed away from a severe storm surge and high winds. Those houses that weren’t removed from their foundations suffered serious damage. 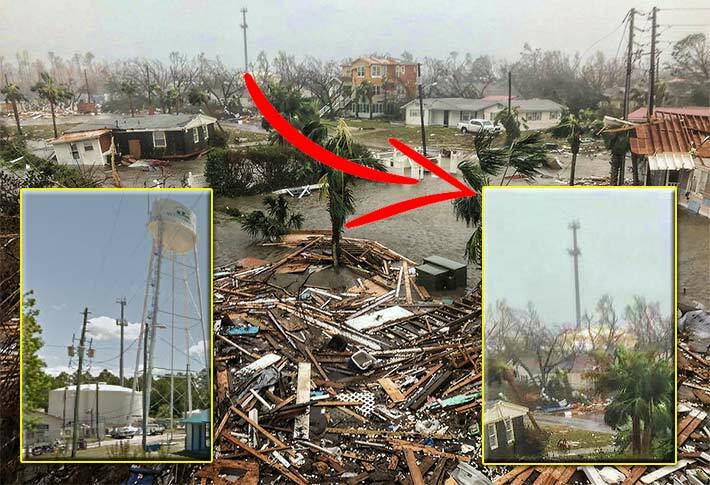 In the photograph, at top, a Verizon occupied American Tower Corp. 153-foot monopole erected in 1997 when EIA/TIA 222-F was in effect requiring a wind speed design of 100 mph, survived Hurricane Michael’s 155-mile onslaught, but an adjoining city water tower appears to have collapsed. It is not known if American Tower’s elevated equipment shelters survived. As of 4:00 p.m., no incidents of tower failures have been reported to Wireless Estimator.